Discovering new producers in the realm of instrumental hip-hop and jazz can be challenging. Songs often go as quickly as they come. Artist names are nondescript and sometimes impossible to find through search engines. The process of music discovery itself can seem elusive in this sub-genre. Sitting down with a new beat tape from a reputable collective can be a fruitful way to overcome this challenge. The collectives - independent labels from across the world which vary in their sophistication and infrastructure - track and compile the best in beats for their compilations. By doing so they make music more accessible to fans. They offer a harmless shortcut through the process of music discovery, and become a tool that enables the listener to dig deeper. Few imprints make this process as easy and enriching as Inner Ocean Records, the progressive independent label based in Calgary, Alberta, Canada that today presents the second iteration of their seminal BLESS compilation series. BLESS Vol. 2 is a triumph of curation, offering almost four hours of music from 99 producers. The producers range in notoriety from globally ranking beat legends like Vancouver's bsd.u to individuals like Mojarra - Da Smokefish from Colombia who has 24 Soundcloud followers. Bless Vol. 2 gives a nod to the international nature of the beats community. Artists on the compilation represent 25 countries. The cover art was designed across the world from Calgary by Zom Kashwak of the Philippines. With almost 100 contributing producers of varying backgrounds, styles, and sounds, the sonic aesthetic across the compilation is startlingly consistent. That's not to say it's flat or unvaried, rather that certain common threads run throughout it. The music is not hard or particularly rough-hewn, although STLNDRMS from Atlanta, Georgia has a nice cut on there. Its not exceedingly jazzy despite contributions from artists like ØDYSSEE of Paris, France. The BLESS series curates more specifically towards the spacey, airy, experimental side of beats music. Take for example the string of tracks on Side A from "forgettable" by baechulgi to "[dragon.wave]" by Borealism. These are ethereal, meditative soundscapes as much ambient music as hip-hop. This run includes our favorite track on the compilation, "Somber" by G Mills. With a project so large and diverse, future listening is bound to reveal hidden gems and new favorites, of course. For now the perfected alignment in "Somber" has us hooked. But find your way to the back of Bless Vol. 2 and you're bouncing disembodied in a raw, stoned, trip hop sound approached from another angle entirely. The spaced-out lo-fi vibe is less dominant on Vol. 2 than it was on Bless Vol. 1. 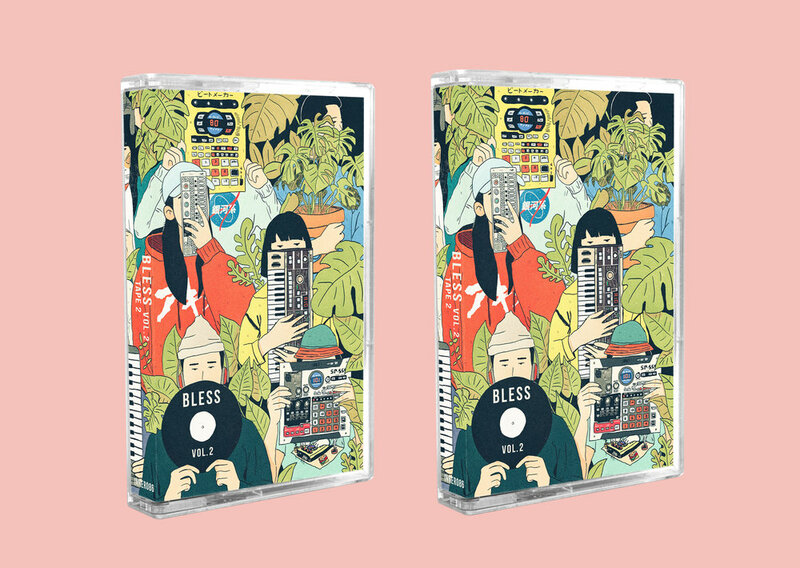 The first installment in the BLESS series was co-curated by Saikei Collective out of the Philippines and O-nei-ric Tapes out of Syndey, Australia. Both of these imprints are out there in terms of their sound, particularly the latter. They were not directly involved in the curation of Vol. 2. The quasi-psychedelic tone they set carries over, but there's more jazz, more lounge. Inner Ocean releases a ton of LPs and EPs, but Cory favors the inclusivity that compilations afford. "Compilations are perfect, because everyone can be featured," he said in the coffee shop, stirring over a tea. "I'm feeling good about this tea thing," he said to Mike, joking but only slightly. (See track 73 on the compilation, "Coffee Cult" by Ridhorules). Cory wore a black Inner Ocean crew neck with the label's signature swirl logo dominating his torso. He's soft-spoken and more overtly philosophical than Mike. Their demeanors are synchronized only in their mutual affinity for the beanie. "I never want to be that label that says 'we only do this or we only work with these people'. I want anybody who’s doing something cool to be able to say ‘hey I’m going to get in on that’." Inner Ocean releases always come within at least one physical format. Bless Vol. 2 is available on cassette tape, the lo-fi trademark, but the label has also decided to press a selection of tracks onto a limited double LP crowdfunded through Q-rates. We're eager to find out which tracks are selected. In the interim, we offer our favorites cuts from each tape side of the compilation. Inner Ocean strives to release music that will still resonate three to five to ten years into the future. By compiling stellar work with a concentrated aesthetic from both the world's best beat makers and unknown bedroom producers, they've hit their mark yet again with Bless Vol. 2. To ensure your own experience with this compilation lasts, pick up a hard copy over on their website. Bless up.